I mistakenly purchased a few of these 28 pin dip sockets with round holes, thinking I was buying the sockets I'm use to with two flat contacts that press together. Although I can force a dip into the round holed socket, it doesn't seem to seat as well. What is the round holed socket really designed for? Actually, I'd prefer the "Machine Pin " type sockets. 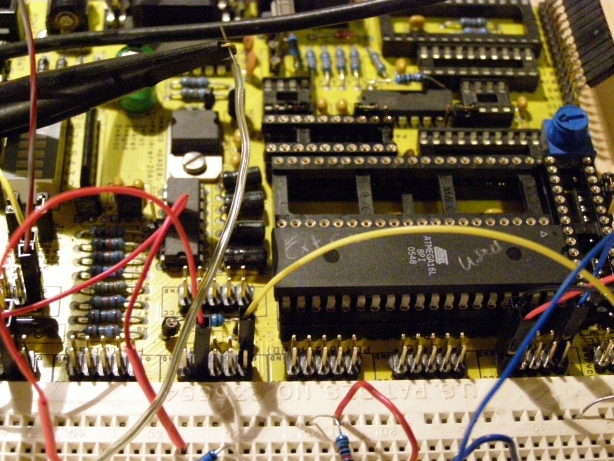 I haven't used any with the AVR, because I pretty much use SMT for all of my projects these days. The attached is an 8X PLL multiplier which is just one of two PCBs in a project I designed, back when I worked for Schwan's. "Machined Pin " IC sockets are more expensive then the typical "High Insertion Force " type sockets, but are more durable - especially if there is a lot of insertion/removal cycles of the ICs. When the board in the picture was fully assembled and working, it received a programmable square wave from OC1A, multiplied it by 8, and then formed quadrature output A, *A, B, *B, MKR and *MKR signals. This PLL multiplier, along with an AVR based controller, was simulating a quadrature encoder to establish speed/position reference of a butchered up servo system that was driving a conveyor system that required precision velocity and position control. These turned pin IC sockets are often used in high reliability applications. 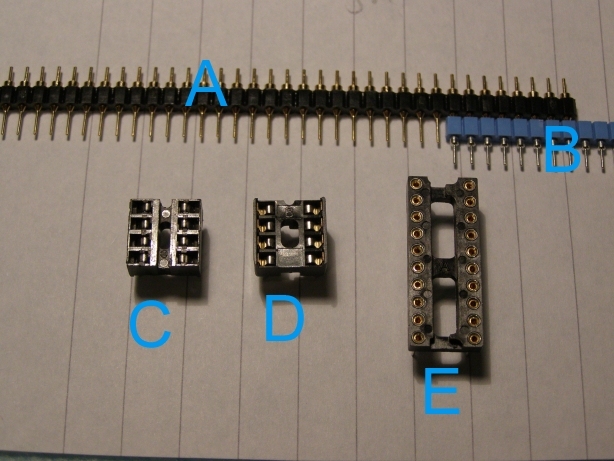 While they will happily take a regular DIP IC, there actually are ICs that come with round pins that need these sockets. I only use turned pin sockets, cheap ones cause too many problems. I can only affirm the comments already made by Carl and Leon. If you need to use sockets and can justify the cost (in production) although I consider it mandatory for proto-typing, "Machine Pin" sockets are the way to go. I'm quite surprised to hear that you feel that a standard DIP part doesn't seem to "seat" as well as an el-cheapo DIP socket as per the photo on the left. You really can trust us "old folk", when we tell you that the Machine Pin socket is actually seating and holding your DIP chip much better than the socket on the left. The machined pin sockets are a little less forgiving for alignment. Before you insert your DIL chip, press each row of pins against a level surface to ensure the splay is removed. A metal ruler is ideal. A piece of paper on a level surface is fine. You do not really have serious worries about static unless you try it directly on some polystyrene or other plastic. Hello everyone. Thanks for the feedback and insight. I wasn't hitting the right google terms, and was interested in hearing from those who could enlighten me. Thanks. Carl, nice board. Sounds like it was an interesting system, and one that you certainly hoped everything worked right the first time! Interestingly, I recently had a problem with a board I hadn't used for a couple of years with a socketed MCU in a turned pin socket. I kept getting errors when I tried to program and debug the chip. Suspecting that the pins had become oxidised I extracted it and reinserted it. It then worked OK. It would probably have been OK if it had been in a working system, the current through the pins would have kept them clean. Chips working their way out of a socket with thermal cycling is another problem. I had that happen with the BIOS chip in a PC many years ago - it was quite puzzling at the time. I think that there are special sockets to prevent it. I would have thought that the two flat blades pinching the flat pins would have given a better physical connection that the flat (rectangular) pin inside a circular socket... Although granted the current per surface area would probably be less. Given all of the above info I won't hessitate to use them for my projects. Leon, I remember wiggling the chips and cards was a standard part of troubleshooting PCs in the old days. They are still there, inside the round hole. See if you can find a catalogue that shows a cut-away view of the inside of the socket pin. I got in the habit of pressing that BIOS chip back in every few weeks, it kept working its way out. At 3: if the connection-point is gas-tight, this is a great and low-cost alternative. Very suitable for production. 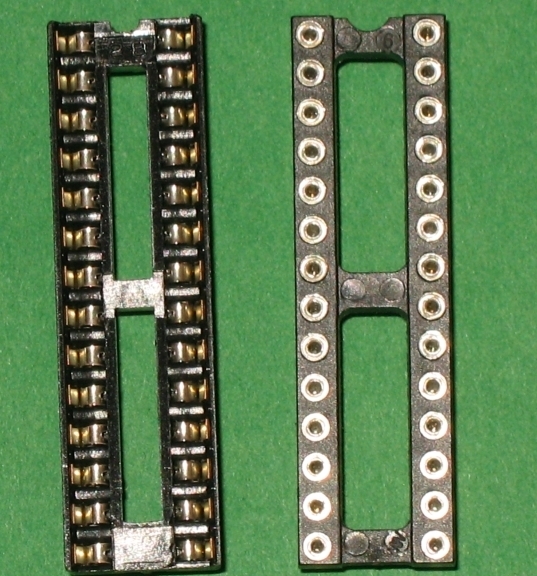 The most common ones are the tin-plated sockets like photo D: a two sided contact. This is what I use now (has to do with supplier). But they are not the best. I have no data yet on ROHS IC-sockets. But having experienced soldering-issues with 0.1" headers, I am not very optimistic. Might not be a residue thing. The tin plated pins are a different shape, so they might be deforming the contacts inside, causing problems for the smaller gold plated pins. Agreed. That may be the cause, or at least a factor as well. Nard, in your photo I see a breadboard and am reminded of an old project, on an even older breadboard. It had >= 1 intermittant connection(s). I couldn't figure out why my code wasn't working. Usually my error, this one was due to poor connections on the worn out protoboard. due to poor connections on the worn out protoboard. My main reason for not using them. Components with thicker leads spoil the grip for other components. 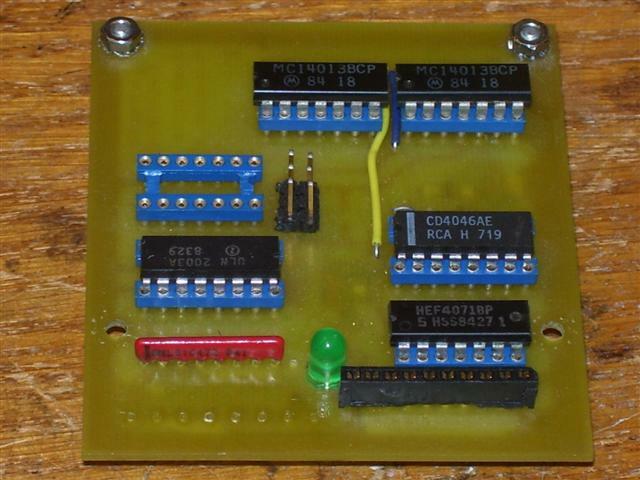 The breadboard on the photo is the oldest I have: still going strong after 30 years (give or take a few years). It's tiny brother sits on Smiley's Butterfly carrier board, and that is still fine too. A year ago I bought two new ones: a large (3 singles on a aluminium plate) and a single. The large one has some .... uhm ... brown tanning .... just local: experiments with SMPS :) These latest ones are not so good. What I like about them: a quick test setup is easily done. But OK, there are drawbacks.